Please write you testimonial here. Local reviews, recommendations, deals,and cuppons from people like you, including those you know. MarchantCircle is the largest online network of local business owners, combining social networking with web listing. Kudzu makes it easy for you to choose the best service providers for your home and family. Recommendations for things that matter most. Find out exactly what you need to know about local businesses, instantly! Yelp is the fun and easy way to find and talk about great local businesses. Our reputation management program makes it easy and fun for customers to leave a review, even when a computer is not available. 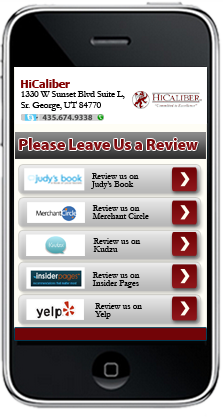 Simply click on our user-friendly review tool via Smartphone!